When Amazon Echo launched we thought it was a great 'platform' for music, thanks to the way it integrated Amazon Music Unlimited and Spotify, but unfortunately one that sounded quite cack. Our recommendation up to now has always been to buy an Echo Dot and plug it into a decent speaker with a line in. A Sonos speaker, for instance. Well now Sonos 1 offers another, more elegant option: for £199, it's a Sonos speaker with Alexa built in. If you have any Echo and an existing Sonos setup and would rather not shell out a further £199, you can also now control your older Sonos via Alexa too – a new Sonos Echo Skill is available to access RIGHT NOW. 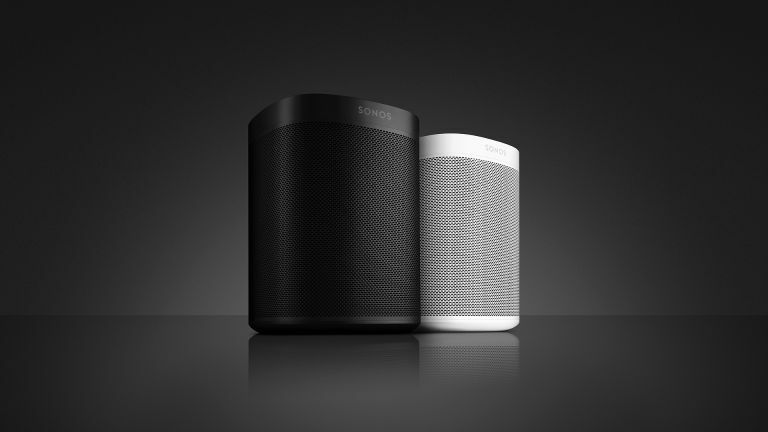 Despite looking a lot like Sonos' old Play:1 speaker, except the colour choices are now Very Black or Totally White, the Sonos 1 has been almost entirely redesigned on the inside. What you end up with is something that, at first listen, seems to sound much the same as Play 1, but with a quadcore processor and six-mic array letting it serve as both an AI assistant (Alexa at present, but it could in theory support Google Assistant or even Apple Siri one day). The boosted processing power also mean it can be updated and adapted in much more versatile ways in the future. It is a true 'platform' rather than just a Wi-Fi speaker with knobs on, as Sonoses (Soni?) have been up to now. However, you can also tell the speaker to play through your other Sonos speakers ("Play Lady Gaga in the kitchen"), even if they are older ones that are not Alexa-compatible. As with Play 1, you can pair two Sonos 1s in stereo or use them as front and/or rear speakers in a setup with a Sonos Playbase or Playbar. It is, in truth, all very seamlessly done. For just shy of 200 quid, it's great. In other interesting Sonos news, its speakers support 80 3rd party services – mainly music, but also smart home – with a further 50 about to roll out via an open API and 'favoured partner' programme. By 2018 this will also include Apple AirPlay 2 and Google Assistant. That feels like a big deal. Sonos, in short, is fully abandoning its original, walled garden approach so its largely excellent speakers can act as the output for all the key music services. Sonos wants to be the default musical part of your smart home, and the output for whatever content streaming services you happen to favour. Despite that, it has now spruced up its own app. This has long been a bit idiosyncratic (or 'a dog's breakfast', if I'm being less diplomatic) but now promises to offer easier access to your music and less head-bangingly irritating control of multi-room. As an extra-cool feature, as you use Alexa to use music, the Sonos app updates to show that, letting you move seamlessly between voice and mobile control. And there are still buttons (well, touch controls) on the top of the Sonos 1, so there's always that option, too. We thought Amazon would launch a more 'hi-fi' version of Echo at its recent event. The fact that it didn't now either looks quite stupid, or (if their deal with Sonos is a favourable one) very clever. Who knows?